"Another Part of Me" Mix Master Slave Track Sheet from Westlake Recording Studios, used in studio by Michael Jackson, Quincy Jones, and Bruce Swedien. "I Just Can't Stop Loving You" Mix Master Slave Track Sheet from Westlake Recording Studios, used in studio by Michael Jackson, Quincy Jones, and Bruce Swedien. License plate surround, holder that reads I LOVE LOUIE MY LLAMA. "Just Good Friends" Mix Master Track Sheet from Westlake Recording Studios, used in studio by Michael Jackson, Quincy Jones, and Bruce Swedien. Michael Jackson's performer card and brochure from the 1972 Royal Variety Performance for the Queen Mother. Letter of reminder to Michael Jackson that he is due to deliver another album to CBS records before April 1983. Handwritten note from Michael's dermatologist Arnold Klein, written in black felt tip marker on his personal stationery with envelope. Reads "Dear Michael: I Miss You." Date of origin unknown. Large poster of Michael Jackson in full Samuraï costume. Bronze sculpture "Children of the World" by South African artist Danie De Jager showing Michael on a fence above several figurines. Dated 1996. 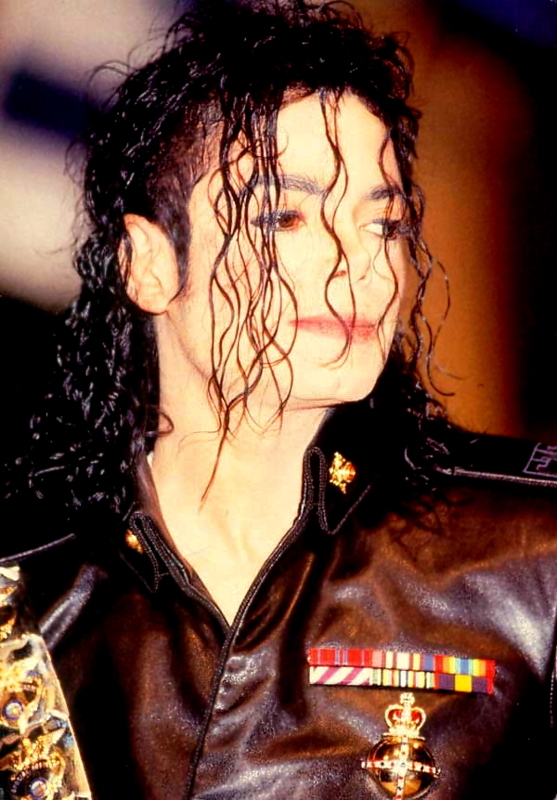 Three bronze sculptures of Michael by South African artist Danie De Jager. One of them shows Michael dancing, the other two show scenes from the 1996 Earth Song video. Two piece BAD style leather costume custom designed by Dennis Tompkins and Michael Bush for Michael's famous pet chimpanzee Bubbles. The jacket is signed on left front in silver felt tip pen, "Love Michael Jackson". Group of three busts of Michael used for the special effects in the 1997 Ghosts short film. Each bust is mounted to a black wooden base on plexiglass sheet. Michael received this painted wood sceptor during the Orchestra March in Moscow in 1996 and carried it while marching in the parade. Manufacturer: Chess Master Golf Co.
Dome presentation of Michael Jackson as the PRINCE OF FANTASY & friends. A vintage barrel backed chair with gilded carved wood used by Michael in a 1984 photoshoot with Michael Rolston. The chair features an eagle head on crest with hairy paw feet, with amber velvet upholstery. Emmy nomination plaque reading "Academy of Television Arts & Sciences Honors Michael Jackson Motown 25: Yesterday, Today, Forever May 16, 1983 Nominated for Outstanding Individual Performance In A Variety Or Music Program. Figure of Michael in BAD video clothes. Origin unknown. Personal frame belonged to Michael.